A county council has launched an external investigation after an internal audit revealed public money had been spent on lavish events. NEA Properties which belonged to Northamptonshire County Council paid thousands for a rugby club hospitality box and a vintage bomber flypast. An audit of how the company was run was carried out internally in 2017 after concerns were expressed by a whistle-blower. Two councillors were its directors. The latest move comes after a joint investigation by the Local Democracy Reporting Service and the BBC into the financially strapped local authority. It found the council's limited company used some £180,000 of the £820,000 proceeds from the 2014 sale of council-owned buildings to fund items such as £3,624 on a flypast at a Grafton Underwood memorial event in May 2015. Some £80,000 was also spent with Northampton Saints and the council had use of a corporate hospitality box within the rugby club. NEA Properties also spent £2,700 on a heritage dinner with string quartet and £250 on cheese and biscuits at a stately home event. The internal survey of accounts was held after the then UKIP county councillor Michael Brown raised concerns about expenditure in January 2017. The audit of 2015 spending found that documentation and governance within the company was minimal. "There is no evidence of improper spend or improper management of the company but in the absence of various records only limited assurance can be provided," the auditor's report said. Both councillors were approached for comment. The company was dissolved in 2017. 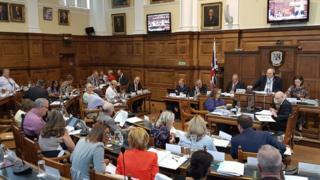 Concerns about finances at the council, which has been issued with two Section 114 notices, banning new spending, were made as early as 2013, according to former leader Heather Smith. "We are not in a position to comment any further on this matter until the outcomes and findings of this (external) review," a spokesman for Northamptonshire County Council said.